Singaporeâs senior minister of state (SMS) Lam Pin Min for the Ministry of Transport and Ministry of Health launched the sea transport sea transport industry transformation map (ITM) on 12 January. 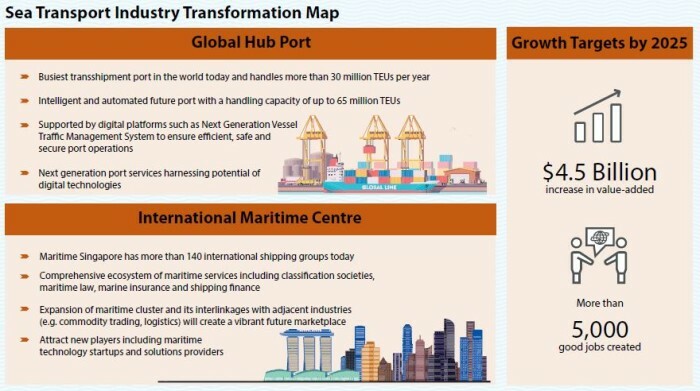 Developed by the Maritime and Port Authority of Singapore (MPA) in partnership with the industry, unions and other government agencies, the ITM builds on MPAâs strategic long term plans to develop Singaporeâs next-generation port and strengthen its International Maritime Centre (IMC). âAchieving this connectivity, and capturing non-physical flows, will add to Singaporeâs competitiveness as a hub,â he added. To ensure that Singaporeâs maritime workforce is equipped with the relevant future skills, new programmes will help bring in well-trained personnel to the industry. In 2016, three maritime SkillsFuture Earn-and-Learn programmes (ELP) for seafaring professionals and port operations executives were launched where the placed 49 graduates so far. The government plans to create multiple pathways to rewarding and enriching maritime careers through these programmes. As a result, this will also strengthen the quality of maritime training and education. Dedicating resources to leverage new technologies and automation to improve operational efficiency, MPA has enhanced the Maritime Cluster Fund (MCF) last year to support maritime companies in developing in-house and customisable productivity solutions. In fact, the MCF has co-funded a whole slew of projects (eg. cloud-based maritime enterprise resource planning systems) to encourage more companies to tap on the fund to invest in such solutions. Not only that, MPA is also developing technology platforms such as the Maritime Single Window, which will be integrated with the National Trade Platform (NTP) to facilitate sharing of vessel and cargo-related information with the wider trading community. 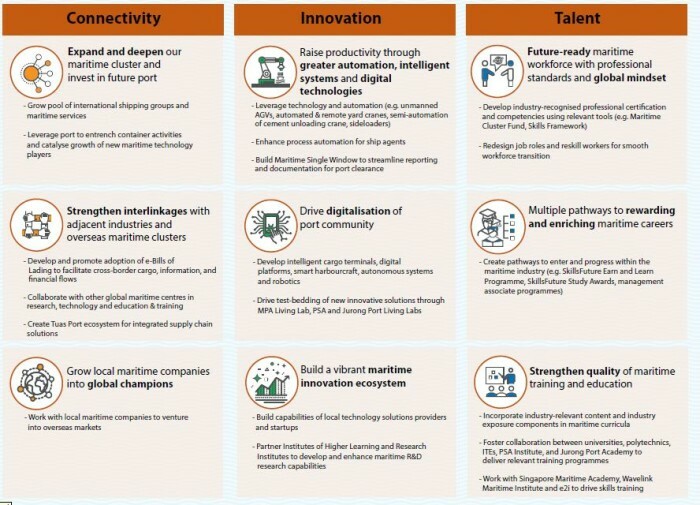 Some initiatives in this area include expanding and deepening the industryâs maritime cluster and invest in future port; strengthen interlinkages with adjacent industries and overtime maritime clusters; as well as growing local maritime companies into global champions. Aiming to grow the sectorâs real value-add by $4.5 billion and create more than 5,000 jobs by 2025, most of these jobs will be PMETS vacancies in the maritime sector. Meanwhile, the launch also saw the signing of give MOUs between MPA and tripartite partners in areas ranging from growing maritime startups to developing electronic bills of lading.